A big thank you to Todd and the crew who make this happen. The choices and selections are varied, unique and there are lots of great deals. Our offer is detailed below, but the sum of it is 20% off any three pack, 30% off of any six pack and mix and match is ok. The shipping on any three bottle order is free. There is a three bottle minimum (mix and match is OK). Riverain focuses on single vineyard wines from great sources. Oakville Tench Vineyard Cabernet, Cardiac Hill Syrah from Bennett Valley (and Yountville Sauvignon Blanc from Gamble Family, but we sold out of that really quickly). 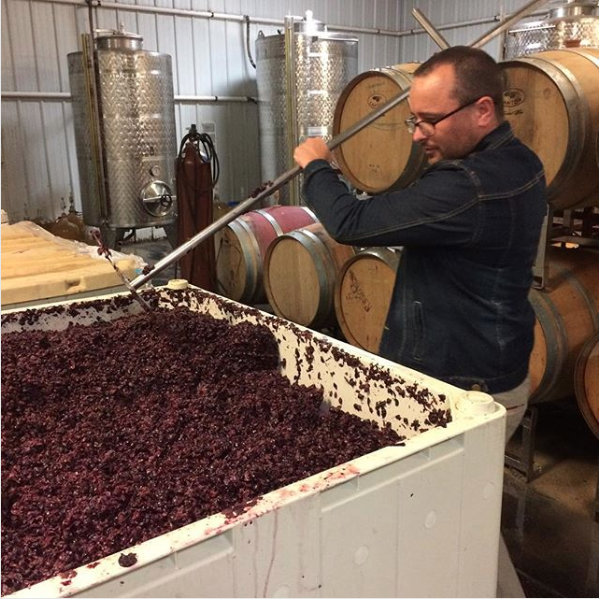 Our winemaker, Thomas Rivers Brown, needs no introduction. He and his team bring incredible focus to getting the details right, especially farming, yields and meticulous vinification. The vineyards at both Tench and Cardiac Hill have more vine maturity and are really dialed in. We picked separate blocks in Tench in 2016 and could not be happier with the quality. This beautiful vineyard in Oakville, next to Screaming Eagle, is a world class site. As always, we give the Berserkers the preview of our upcoming releases and substantial discounts (which will be released to the mailing list in March). In 2016, yields returned to normal plus at Tench and the quality is amazing. We picked two separate blocks two weeks apart and Thomas blended a beautiful wine. Our yields at Cardiac Hill were not so lucky, still off a full 50% from 2014, but the quality and concentration is fantastic. 2016 Oakville Cabernet, Tench Vineyard: This vintage seems to be a great combination of 2013s massive density, tannins and structure along with the forward fruit of 2015. I would take that combo every year. The nose has that Tench combination of red and black fruit, along with some spice from the 80% new French barrels (mostly Darnajou and Taransaud). The palate has beautiful silkiness, with blackberry, black cherry and spice. The finish has the minerality and acid that Tench provides and the tannins kick in, showing that 2013 long aging quality. 2016 Bennett Valley Cardiac Hill Syrah: Our Cardiac Hill Syrah gave us great color and concentration, which it seems to do every year, but 2016, with its relaxed growing season, yet low yields, may have kicked the power up one more gear. We leave in about a third of whole cluster on this wine to cut some of the primary fruit and add some aromatic complexity. The nose has some signature lavender and black olive, but is dominated by very dark fruit. No new oak on this wine allows for the purity of the Syrah to shine through. The finish is huge and long, again boding well for some extended aging. The style has not changed and we think of it as a cross between CA and Northern Rhone, which is the way we like it. Just 108 cases this year. We kept pricing the same as last year. We think the pricing for this quality cannot be beat. Please visit http://www.riverainvineyards.com If you have not signed up previously, you will need to do so so your information is captured by the system. Both wines are 20% or 30% off the 2019 mailing list price. Please use the promo code ten when you order to get this pricing. Mix and match is ok on any of these offers. Cabernet, (normally $125 per) is now $100 per with a three pack purchase and $87.50 per with a six pack purchase. Syrah, (normally $55) is $44 per with a three pack purchase and $38.50 per with a six pack purchase. Free ground shipping is included on all orders but please note the three bottle minimum. We will ship these in February and March as the weather allows. Last edited by Steve Nordhoff on January 26th, 2019, 9:52 am, edited 1 time in total. I'm in for a 3-pack. Last edited by Jason K. on January 26th, 2019, 10:39 am, edited 2 times in total. In for a three pack of the Tench Cabernet! In for 2 cabs and a syrah. 3 + 3 for Me! In for 4 Syrah and 2 cabs- terrific juice! Grabbed a couple of the syrahs. Pumped about those! In for a mixed 10-pack--haven't tried your cabernet before, but had to include a few of those in the mix! In for a 6-pack....4 Syrah and 2 Cabs.... Thank you Steve! Hopefully I just found my Outpost replacement after the buyout. In for a sixer. I can't get to the page to order...it keeps taking me back to my account home. In for 2 cabs and 4 syrah! Am I missing something on how to order? Check that...I got it now. 3 and 3 ordered...thanks a bunch. You have good taste! Yeah!!! These are beautifully made wines, what a deal! Created an account, able to login, but can't see an allocation/unable to order? Never mind, logged in with the offer code and that works. Ordered 3 Cabs. Looking forward to trying these. First time participating in a Berserker Day. Had to get 4 of the syrah...before they disappear:(. Thanks, Steve!